WHAT DOES IT MEAN TO A CHILD OR ADULT TO HAVE A SPONSOR? The majority of the children in our sponsorship program are from extremely poor or dysfunctional families. In most cases, at least one parent attends church with the child. In so many of the villages where we work, there has NEVER been a Christian witness or church in that area, and MTS has brought the message of Jesus Christ for the people to hear for the FIRST time! The people accept the Lord as their Saviour but because of the lack of schooling and illiteracy and the lack of pastors, their growth is very slow. When MTS finds a sponsor for a child or family, things begin to change for the better. The family can then eat at least once a day, they are provided with clothes, shoes & school supplies for the children. Vitamins are provided when we have them, sometimes MTS must help with medical care. Each person seems to suddenly have HOPE for their future. We have discovered that the children will work harder in school so that their sponsors (their new relatives) will be proud of them. Many times, we are able to witness a change in their thinking - their attitudes - their hopes & dreams. . . because now they feel there is someone who really CARES for them. They wait for letters, cards & pictures from their sponsors and proudly show their friends their "other family members". When a sponsor is able to visit the child, this brings joy to the entire family. The cost to sponsor a child is $25 a month. 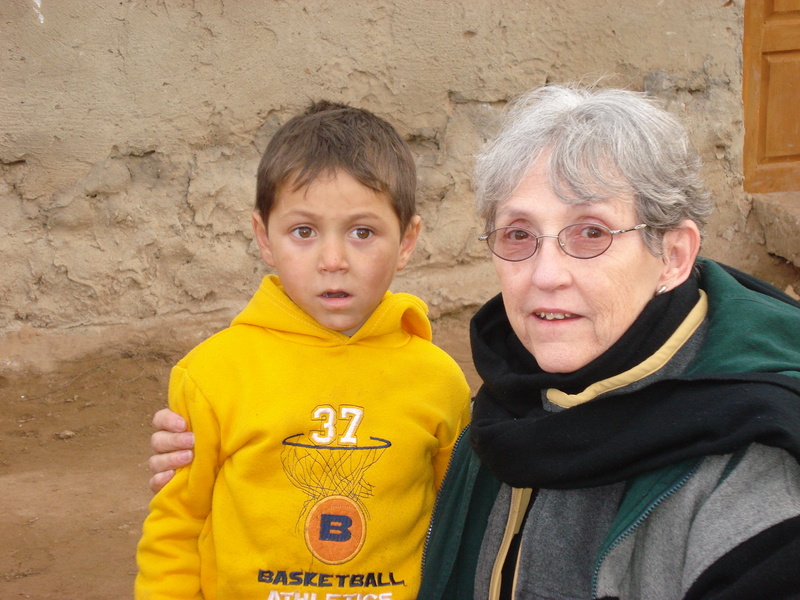 One of our sponsors, JoAn, with her little Romanian "grandson", Armando. Many sponsors send packages to their children at Christmas. When the gifts are delivered, they seem to give a loud message to the child that SOMEONE LOVES THEM!! It is not required that sponsors send packages; however, so many have discovered that it blesses them as much as it does the child. We can ship packages monthly from our office in Blue Ridge, please include a check to Mission To Serve for shipping for $1.80 per pound for your package. It takes approximately 2 months after shipping for the child to receive the package. If you want to make a trip to Romania to visit your child, please contact our office. For many people in Romania, and especially in the villages, a bicycle is their only means of transportation. We can purchase good bicycles in Romania for $150 to $175. These are also used as "carts" to carry large sacks of food items from the local markets.